Compared to other methods the Mako robotic assisted hip replacement is the most accurate and consistent method for placement of the hip components. 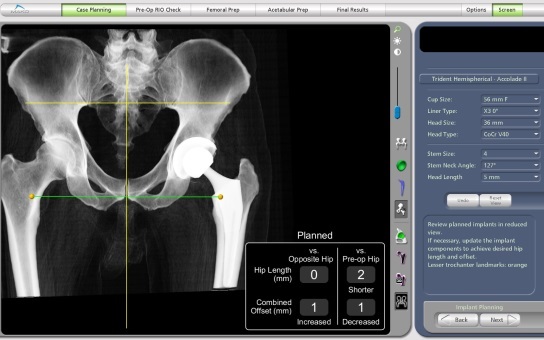 This allows the possibility of improving the outcomes and longevity of the hip replacement. A CT scan is performed before the operation. The CT scan is used to generate a 3D model of the hip joint. 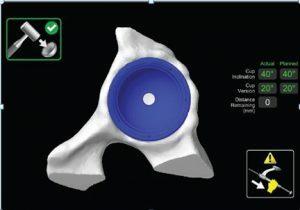 This computer model is then used to plan the perfect position of the hip replacement. Once the plan is confirmed it is then loaded into the robot. 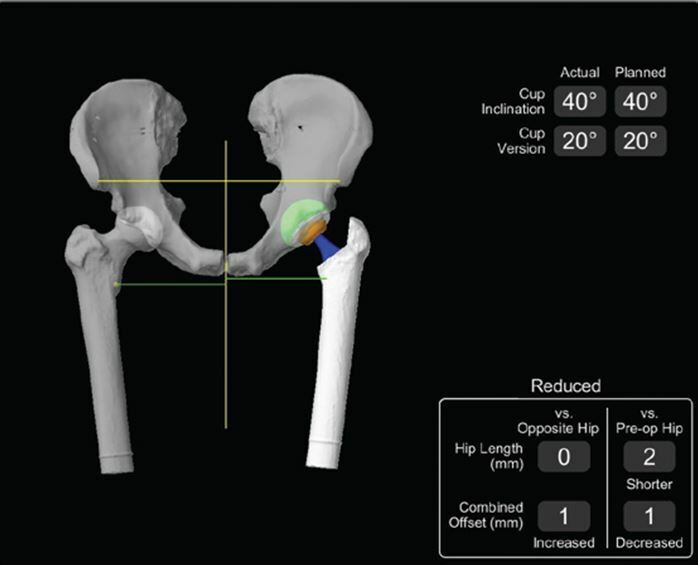 The 3D model of the hip joint is used to plan the ideal position for the hip replacement. At the start of the operation, when the patient is asleep, three small, 1cm, incisions are made on the top edge of the bony pelvis. The robot uses a system similar to that of the GPS satellite navigation in your mobile phone to work out where the body is. 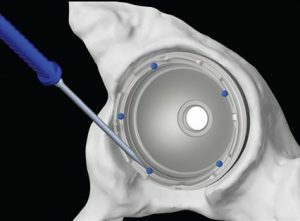 During the operation the surgeon uses a pointer instrument with tracker balls on to identify key landmarks on the hip joint to confirm the robot knows exactly where the hip is. 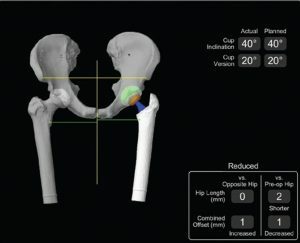 This matches the 3D computer model exactly to the patient’s real hip. The surgeon then performs the hip operation using his normal surgical tools. The only difference is that the robot puts a steadying hand on the instrument. 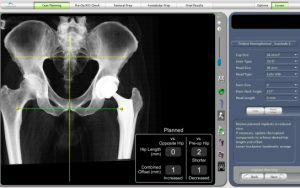 If the surgeon is putting the hip components in exactly as the preoperative plan suggests, then the robot does nothing. 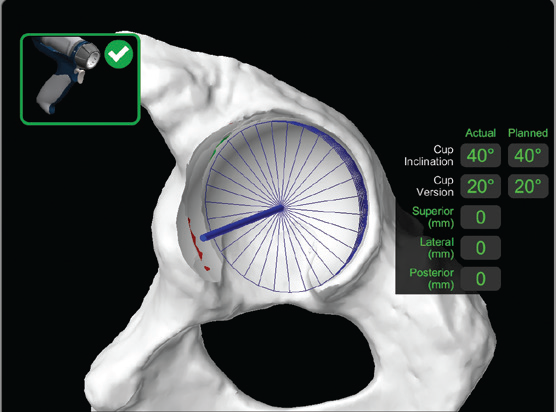 If the surgeon is 1mm out from the plan then the robot nudges him 1mm to the right position. If the surgeon is off plan, then the robot cuts the power off to the instruments so that the surgeon cannot proceed until he corrects his error. In this way the robot ensures that the surgeon delivers the precise positioning of the hip replacement. 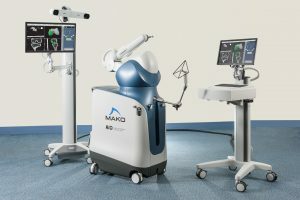 Evidence from studies on the Mako Robotic assisted hip replacement confirms that the hip is positioned more accurately by the robot than a surgeon alone.